Scandinavian suspension for your big bike is finally here. In the world of motorsports, few people have not heard of Öhlins. 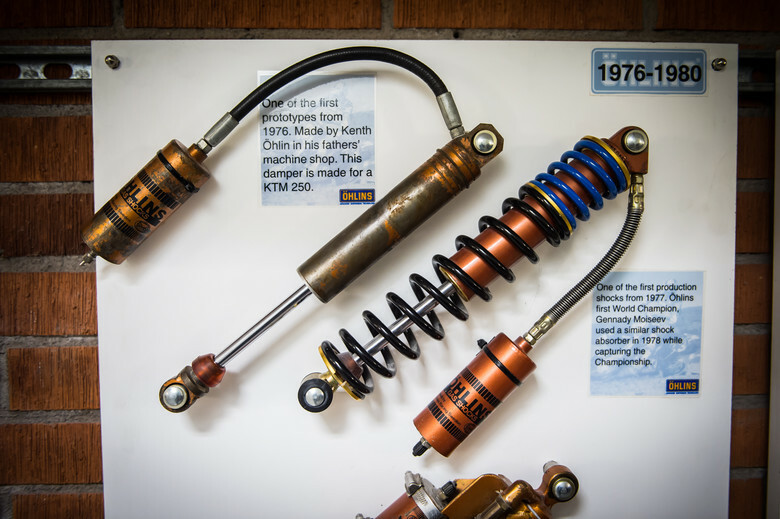 The company’s roots date back to 1976, when Kenth Öhlin decided to apply the skills he had picked up as a kid playing around in his father’s machine shop to producing better suspension components for the increasingly popular sport of motocross. 40 years later, with literally hundreds of world champion titles in every discipline of motorized racing under its belt, the company is looking to leave its mark on mountain biking as well. Working closely with its exclusive OEM partner Specialized, the Swedish crew has developed a small but pertinent range of high-performance suspension components that can today be found on many models in the big-S line-up but also off the shelf as an aftermarket offering. And as they have done in so many other disciplines, the products have proven themselves on the race track already, with Loic Bruni and Miranda Miller picking up World Champion titles in Cairns in 2017 with a full complement of Swedish squish on their steeds. The victorious fork was still a racing-only prototype at the time, but the company is launching the production model today and making it available to the general public. We’ve just spent a couple of days in Sweden riding the new goods to get a feel for what they have come up with - read on to learn more! When you pull up outside the Öhlins HQ and main production facility in Upplands-Väsby just outside Stockholm, there is no mistaking the bright yellow logo that proudly adorns the various buildings found on campus – and if you’re a fan of motorsports in general, you’d be very excited to be here. The first building the company moved into on this site is still in use today, but several more have been added over time as the company has grown. Once accompanied by somebody with the proper level of clearance (the place is locked down like Fort Knox! ), we were treated to a trip down memory lane and a guided tour of the production facilities that are nothing if not impressive. 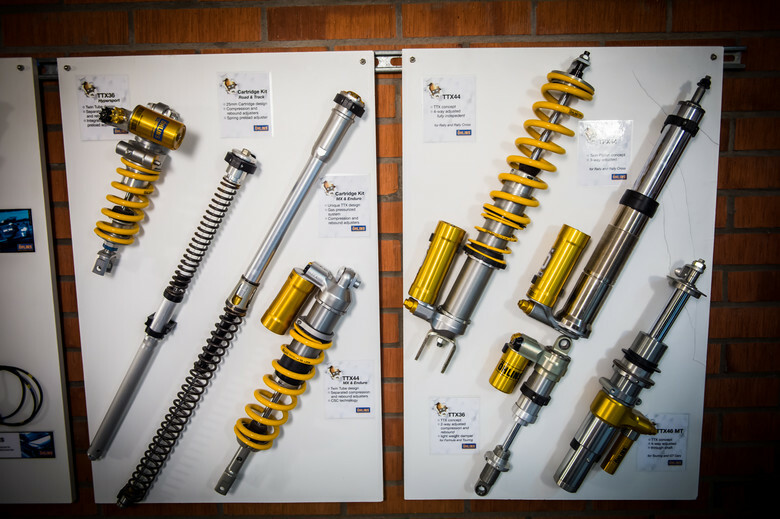 Öhlins still produces and/or assembles the majority of its products right here in Sweden. No mean feat in these days of heavy international competition where production outsourcing is generally the rule of the game. Öhlins says this gives them unparalleled control over quality, but it is unmistakably a source of pride as well. The working environment is clean and well appointed, and the company appears to take good care of it employees – we were treated to lunch in the onsite cafeteria and we were not left wanting. The factory is divided up into different production lines, fed by incoming raw materials or pre-fabricated components on the one side while spitting out the unmistakably gold-hued and much lusted after finished goods on the other. Everything that goes on here is tightly controlled, right down to the precise torque values, oil volumes and gas pressures that are automatically recorded against every individual unit as it makes its way through the production line. Look up a serial number and you’ll know everything about that unit’s full manufacturing history, which helps the company keep track of defects and why they occurred. On the mountain bike side, the TTX-22 coil shocks are made and assembled right here in Sweden (some of the castings are done in Asia), while the rest of the MTB line-up is all manufactured in Taiwan (where Öhlins also has a factory). There is a dedicated mountain bike section in the laboratory area, where a lot of the R&D and testing takes place. 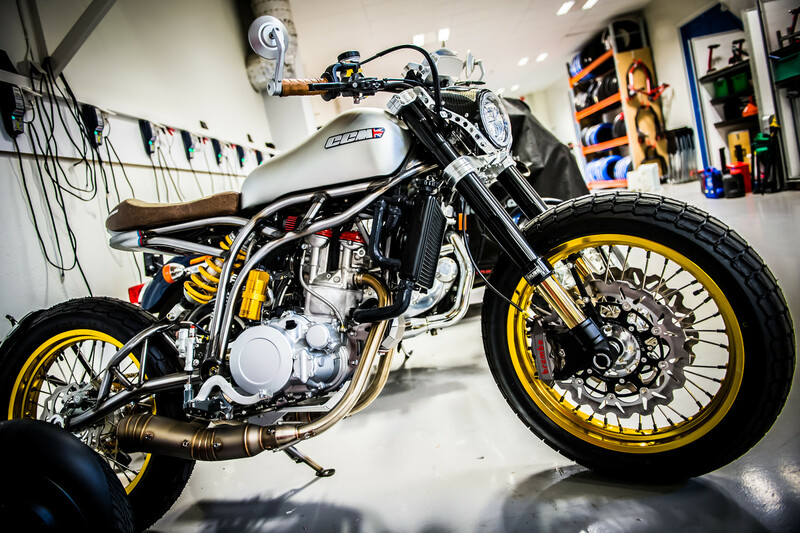 Öhlins also employs a full-time test rider on its staff, and of course they rely heavily on their exclusive OEM partnership with Specialized when it comes to developing tunes and other characteristics. Öhlins entered the mountain bike component market during a time of much uncertainty. New wheel sizes were being introduced, and other standards were constantly evolving as well. 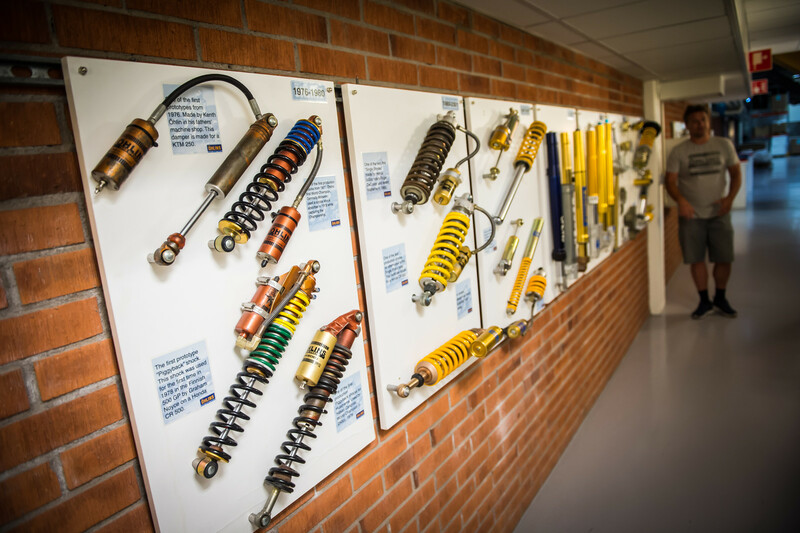 This didn’t make their life any easier when it came to designing and producing a new range of suspension components, which partially explains why they have taken their time with it in general. The range has grown at a slow but steady pace, to the point where they pretty much have all the shock length standards and wheel sizes covered. Except for a full downhill fork, that is – until today! Based on the TTX tech inherited from the motocross line, the company has had damping cartridges for other manufacturers' forks available for some time, but now the time has come to pull the curtains back on their first complete production downhill fork. Meet the DH38 Race Fork. The DH38 Race Fork features 38-mm stanchions. Rather than just a ploy to be different to the main competitors, the choice of stanchion diameter boils down to the same design philosophy that underpins the whole range: make a product that is race ready but that can also be used by the average rider. Öhlins’ extensive testing led them to the conclusion that the ideal combination of stiffness and compliance can be most readily achieved with a 38-mm stanchion diameter. To cater to the different wheel sizes available today, and to make it easier to play with the offset of the fork to match specific frame designs or to meet certain handling goals, Öhlins went with a single lower leg design that can accommodate both 27.5 and 29 inch wheels coupled with a set of interchangeable crowns of different offset. This reduces the complexity involved on the manufacturing side, and also introduces a certain degree of flexibility for the end-user – taking your fork with you as you change wheel sizes, for example, is now a whole lot easier and cheaper. The lowers will fit up to a 29/2.8 or a 27.5/3.0 tire and are Boost-only (adapters exist to let you run a non-Boost hub if you need to). The axle system “floats” which basically means that the lowers can remain perfectly aligned with the stanchions when torquing down the axle, to avoid causing unnecessary bushing bind. Exclusively made for big bikes, the DH Race Fork features 200mm post mount bosses to mount your big boy brakes on. When it comes to the base tune and the range of adjustments on offer, the Öhlins guys are firm believers in what they call “usable range”. Internally, the DH38 Race Fork is based on the TTX twin-tube technology that has been a staple of the company’s designs for years. The twin tube design allows oil to recirculate more easily via separate, parallel oil circuits as the shock or fork cycles through its travel, which is said to help improve damping feel and consistency. The damping system features an internal floating piston design which operates at relatively low pressures, which Öhlins says also helps with the smoothness and consistency of the damping response. The DH38 Race Fork offers adjustable high- and low-speed compression and a single rebound adjuster, in addition to the two externally accessible air springs. On the air-spring side, the DH38 Race Fork inherits the three-chamber system found on the RXF 34 and 36 trail bike/enduro forks. This system features a positive air chamber, a self-equalizing negative air chamber, and a third “bottom out” chamber that basically allows you to shape the spring curve by increasing or decreasing the air pressure here. This is Öhlins’ version of a token system, only here it uses air pressure to achieve more or less the same results as increasing or decreasing the size of the main air spring chamber with tokens. Of course, this has the advantage of being easier to access than a token system, since all you need to tune your bottom out support is a shock pump. Note that you CAN also modify the volume of the bottom out chamber as well as the main air chamber by changing the size of some internal spacers, but this requires pulling the air spring apart. When it comes to the base tune and the range of adjustments on offer, the Öhlins guys are firm believers in what they call “usable range”. In their opinion, a suspension product should be fully rideable at the very extremes of the adjustment range, or there is no point in having it. In other words, neither compression nor rebound needs to go from fully locked out to fully undamped, since nobody in their right mind would ride them that way. Furthermore, the company also feels that a commercially available product should offer a base tune that works well for the vast majority of riders. It is easier to custom tune the units used by a race team than it is to sell a racing tuned product to the grand public and have them struggle to figure out how to enjoy it. To help every rider achieve their optimal set-up, Öhlins has built up an extensive “settings bank”, and they will also offer an online configurator where you can play with all the parameters and instantly visualize the effects on the spring curve. Note that if you don't want to invest in a whole new fork, the new damping tech will also be made available in a cartridge that drops into a FOX 40 or RockShox BoXXer. As for a coil DH38 Race Fork, will that be an option in the future? The company didn’t offer a formal answer, but looking at the rest of their mountain bike range it would be very surprising if that didn’t happen. Öhlins built their company on coil, after all. After the factory tour and the presentations, the time had come to put tires on dirt to see how the DH Race Fork would perform in real life. We headed up to Järvsö Bike Park, a small resort about 3 hours north of Stockholm. The mountain here may lack the physical dimensions of its big brother Åre, but what it lacks in size it more than makes up for by a. being much closer to the capital region and b. investing heavily in building as many fun trails as possible. We were met on site by a small but delicious smorgasbord of downhill bikes, proudly sporting some of the very first DH38 Race Forks to ever see action. After choosing our steeds and getting our set-up dialed in, we headed up the hill. Right from the start, we found the DH38 Race Fork comfortable and compliant. After getting used to the terrain and learning a few of the trails, we were able to start pushing a bit harder, which revealed a composed fork with more than adequate reserves for when things get a little hairy. We stayed close to the recommended settings to start with, and if anything, we spent more time dialing in the rear than we did worrying about what the fork was doing. We started out riding the all-new Commencal Supreme 29, the very same frame that Amaury Pierron has ridden to victory in the last two World Cups, then moving over to a 27.5-inch Canyon Sender and finishing up on a 27.5-inch Santa Cruz V10. All three fork samples provided the same easy to get along with, consistent performance within a few psi and a couple of clicks of the recommended settings. Dialing in the feeling and balance of the rear across three such different suspension platforms was more of a challenge, but one that the STX-22 was well equipped to deal with. The only fly in the ointment is the force required to physically twist the knobs – we’re not sure if it’s a Swedish thing or what, but all the stuff we rode had adjusters that are hard to turn. Ultimately, we feel that Öhlins has delivered exactly what it set out to produce, a high-performance fork that is easy to tune and that works extremely well out of the box. Playing around with the bottom out air pressure a bit, we were able to add support and have the fork hold us up a bit more around the mid-point, while both compression and rebound adjusters offer a very usable range of tuning that is hard to really feel out in the parking lot but provides the desired response on the trail. Throughout this experimentation with the settings, the fork continued to be both supple and comfortable. Ultimately, we feel that Öhlins has delivered exactly what it set out to produce, a high-performance fork that is easy to tune and that works extremely well out of the box. More time would be needed to suss out any particular weak spots and really push the adjustment range to the extreme, but at this point the DH38 Race Fork has us convinced. So who is the DH38 Race Fork for? To start with, it is a premium product, priced in line with the high-end offerings from FOX, RockShox, DVO and BOS. Ohlins doesn’t typically make budget versions of its products, so don’t expect a lower-tier offering any time soon – or ever. When it comes to performance, once again with the caveat that we only spent 2 days riding it on unfamiliar terrain and on different bikes, it feels like the Swedish manufacturer has definitely managed to at least match its competitors. The DH38 Race Fork will work for racers and park rats alike, offering a multitude of adjustments that should allow all but the most demanding of fettlers to easily arrive at a good set-up. For those who need to go beyond the base configuration, Ohlins knows a thing or two about custom tuning as well, and whether it’s through the small distributor network or directly via the company itself, racers can expect good support when it comes to extra-curricular tinkering. Is all this enough to cause a new gold rush? Time will tell – for now, all we can say is that we don’t see any reason why the DH38 Race Fork shouldn’t be on the shortlist of any rider looking for a high-performance park or race fork. The DH38 Race Fork will be on the shelves in early August 2018. Johan loves bikes, which strangely doesn’t make him any better at riding them. After many years spent practicing falling off cliffs with his snowboard, he took up mountain biking in 2005. Ever since, he’s mostly been riding bikes with too much suspension travel to cover up his many flaws as a rider. His 190-pound body weight coupled with a unique skill for poor line choice and clumsy landings make him an expert on durability - if parts survive Johan, they’re pretty much okay for anybody. Johan rides flat pedals with a riding style that he describes as "none" (when in actuality he rips!). Having found most trail features to be not to his liking, Johan uses much of his spare time building his own. Johan’s other accomplishments include surviving this far and helping keep the Vital Media Machine’s stoke dial firmly on 11. Any idea why they're fitting a twin-tube damper in this fork when they said it was pointless for the other forks they make? Where did you read that? Both the RXF 34 and 36 feature twin tube damping. Only the previous generation of the Boxxer cartridge used a single tube version, because the previous generation of the twin tube damper used a 22 mm chassis which they could not squeeze into the 35 mm stanchions of the Boxxer (the FOX 40 cartridge was also twin tube). The new twin tube damper is based on an 18 mm chassis, so it will fit in more forks. Air spring looks to be achieving the same as Manitou IRT. That's cheaper than ll the other top of the line DH forks. dat stanchion resting on bare rock ?????? The close-up of the blue fork seal image looks very much like the bit that counts, no? Just checking if you were paying attention.